The Cartoon Art Museum is one among too many nonprofits in San Francisco that has been challenged by high rents, something that NPQ has been writing about in its nonprofit newswire for years, such as here and, more recently, here. The museum was forced to close its doors in June 2015. Rather than leaving San Francisco, it quietly sought and finally found a solution with the help of the city. The museum will move into its new space at Fisherman’s Wharf in spring 2017, thanks to the intervention of the city’s Nonprofit Displacement Mitigation Fund. Once the museum is fully operating in its new space, it will return to hosting nine to 12 major exhibitions annually, along with providing public lectures, a research library, bookstore, and classes for children and adults. The museum’s executive director reports that their new space is “gorgeous” and perfect for the purposes of their mission, not least that the space is easily accessible, “a stone’s throw from Aquatic Park, Ghirardelli Square and the Buena Vista Cafe.” They will announce their plans soon to raise the funds required to finalize the move. One of the Cartoon Art Museum’s initial exhibits in 2017 will be to commemorate the 50th anniversary of “The Summer of Love.” This is a fitting anniversary for the museum to honor, the time in 1967 when some 100,000 hippies spontaneously converged on the Haight-Ashbury neighborhood in San Francisco to embrace a love of music and art (and oppose the Vietnam War). The museum is used to moving around. When it was founded in 1984, it produced showings in other museums and corporate spaces. The great Charles M. Schulz (of Peanuts fame) endowed the museum in 1987, which enabled it to secure its first home. The museum closed in 1994 as it prepared to move to a new location in the summer of 1995. The museum moved to Mission Street in 2001, where it remained until it closed in September 2015 when the rent abruptly more than doubled. 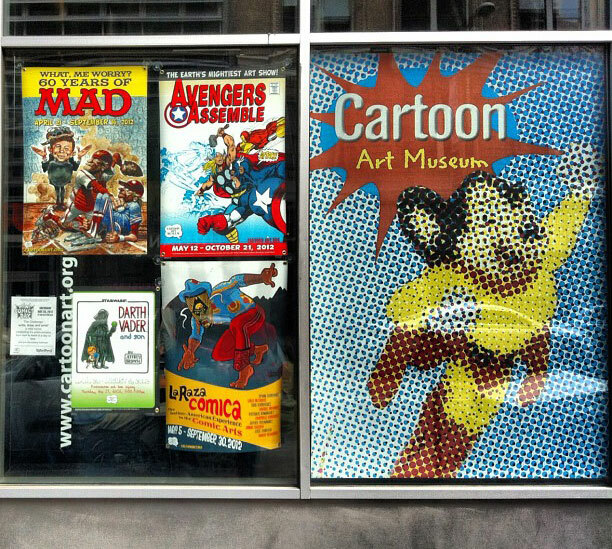 Over the past three decades, the museum has produced nearly 200 exhibitions on topics ranging from politics and sports to children’s literature and Latino culture, and more than 20 publications celebrating and examining the diversity of cartoon art in animation, comics, graphic novels, ’zines and book illustration. These ups and downs through the years relate a consistent story that transcends financial hardship. Many people believe in the Cartoon Art Museum’s mission and they eventually rise to the challenge. Cartoon art matters. The art includes animation, advertising, comic books and comic strips, editorial cartoons, graphic novel artwork, magazine cartoons, and underground comix. The artwork this museum values has ignited the imaginations of most people, swayed political campaigns, spoke truth to power, and in countless ways positively upheld and contributed to civil society through the ages. CORRECTION: This article has been altered from its original form. The spelling of Charles Schulz was fixed, and a reference to events in 1997 has been removed.